Last night, Derrick Rose had another big game for the Chicago Bulls. 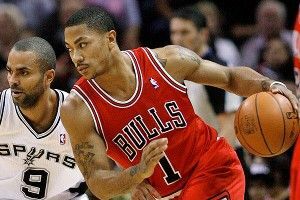 Rose scored 29 points on 10-of-23 shooting in the Bulls’ 96-89 win over the San Antonio Spurs, and with the game on the line, he showed just how much pressure he puts on a defense. The Bulls, up three with a minute left in the fourth quarter and looking to seal the win, called a simple ball screen for Rose. That was all it took to see the effect Rose has on a defense, and how his teammates can benefit from the strain he causes the opposition. As Rose brings the ball past half court, he dribbles it out on the wing for a few seconds to milk the clock. 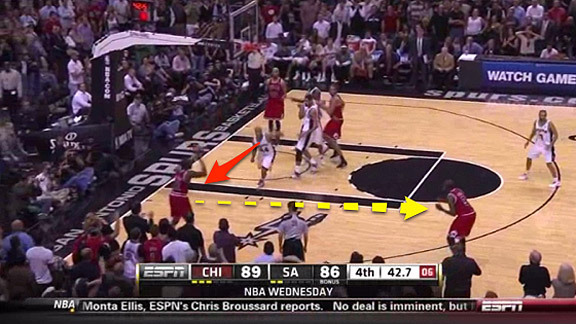 Once the shot clock hits 14, Joakim Noah sprints up to set a ball screen. A set like this isn’t rocket science. The play is just a simple ball screen with the three other players spotting up — Ronnie Brewer in the weakside corner, Luol Deng on the weakside wing, and Taj Gibson in the short corner on the strong side. 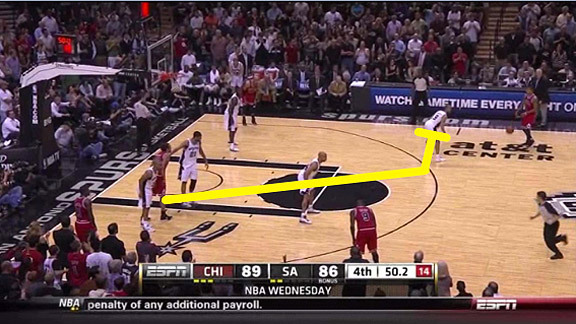 Before Noah even gets in position to set the screen, the Spurs look to trap Rose. 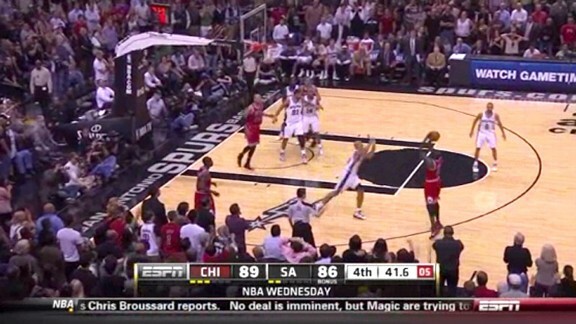 Tim Duncan leaves Noah and extends out as Tony Parker gets over the screen and also sticks with Rose. 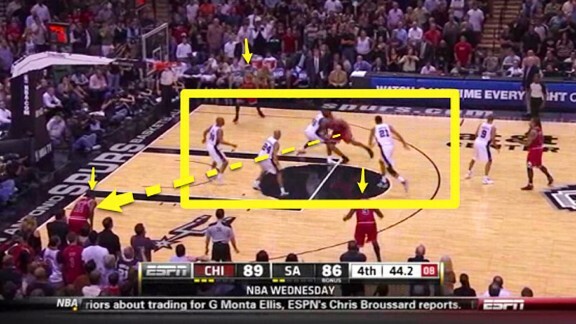 One of the smart things the Bulls do here is that they expect the trap to come and they set the ball screen very high. 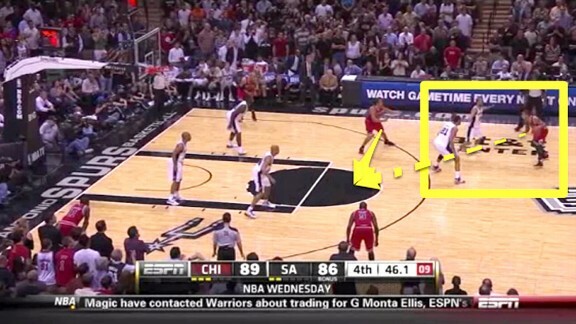 The Spurs are now forced to trap Rose all the way out near half court. This stretches the defense and creates gaps for the offensive players without the basketball. Noah takes advantage of this space by floating to the top of the key and making himself available for a pass from Rose. Even though Noah likely wants to look to create for his teammates, he has enough space that the defense is forced to collapse on him. 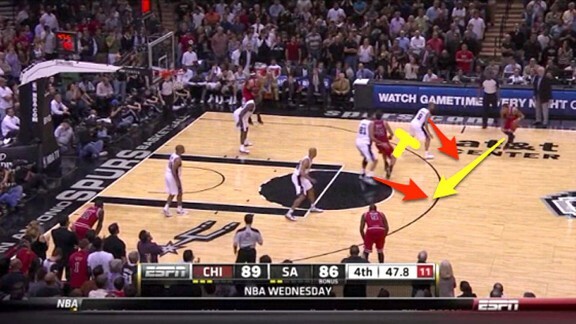 In the screenshot above, there are four Spurs converging on Noah, a player who isn’t all that skilled offensively. The three shooters that the Bulls spaced out are now wide open. Noah gauges the situation and hits Brewer in the corner. The Spurs are now in scramble mode. As the pass goes to Brewer, Richard Jefferson closes out hard on him. Brewer does a great job of understanding that Jefferson is the only Spurs defender leaving the paint, and he makes a quick touch pass over to Deng on the wing. Deng makes the catch and shoots a wide-open 3 in rhythm as Jefferson fails to close out in time. The shot is uncontested, and Deng knocks down the open 3 and extends the Bulls’ lead to six points, effectively clinching the game for Chicago.